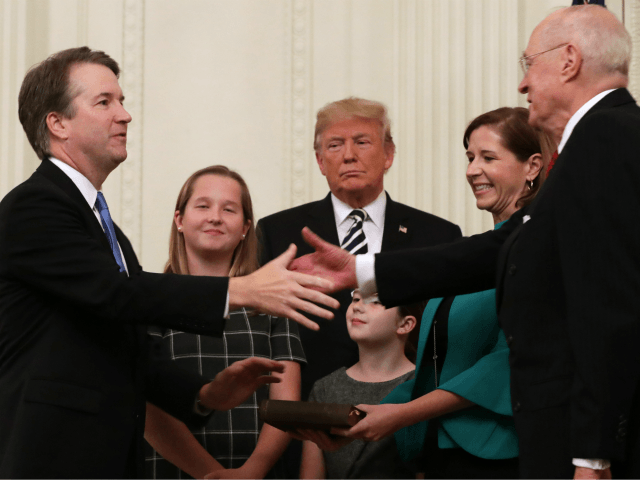 President Donald Trump and First Lady Melania Trump traveled to the Supreme Court on Thursday for the investiture ceremony for Justice Brett Kavanaugh. White House reporters were unable to bring any laptops, phones, or cameras into the Supreme Court but took notes about the event inside. The Supreme Court said that Kavanaugh would not take the traditional walk down the courthouse steps, because of security concerns. The walk down the steps allows the public to see the newly appointed justice in his robes together with the Chief Justice and allows photographers to capture the moment. Acting Attorney General Matthew Whitaker presided over the investiture ceremony after Attorney General Jeff Sessions was fired on Wednesday. The president and the first lady also attended the investiture ceremony for Justice Neil Gorsuch in June 2017. Justice Ruth Bader Ginsburg missed the ceremony after she was admitted to the hospital after falling in her office and breaking three ribs, according to a statement from the Supreme Court.